This image shows a scene from the northern plains of Mars, near the edge of the lowland known as Acidalia Planitia. 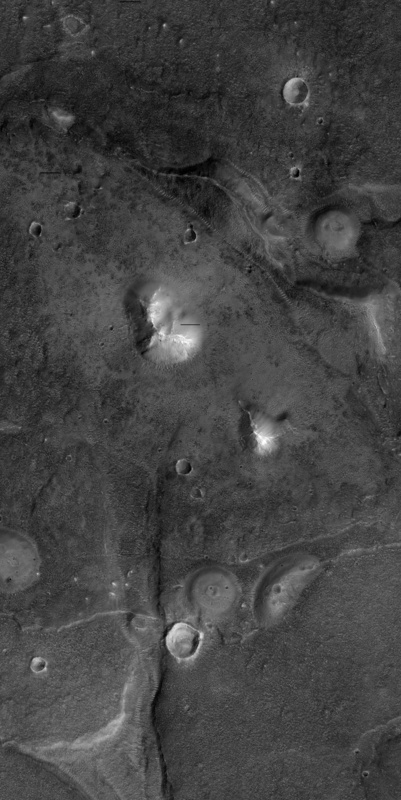 Several features common to the area are visible. Most striking are the circular, pancake-shaped domes with pits or craters at the summit. These were once thought to be volcanic features, but recent research suggests that these are instead mud volcanoes. On Earth, mud volcanoes form when wet sediment is overpressured and squeezed out onto the surface. In many cases, these domes have finely fractured surfaces, which could be due to either desiccation (loss of water) or temperature changes in the ice. 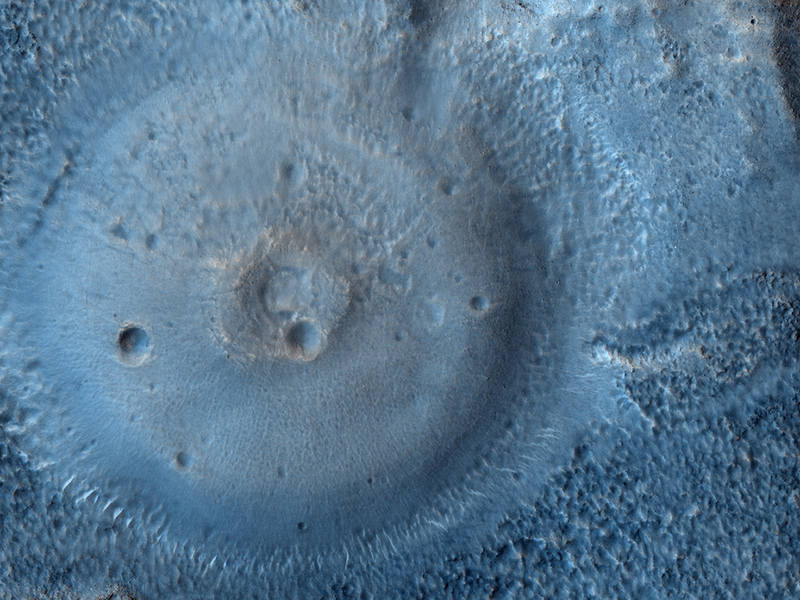 The domes at this side are similar in color to the surrounding material, appearing as blue in HiRISE enhanced color. However, this may be due to a thin coating of dust, as an impact crater in the color swath appears to expose material of a different color. 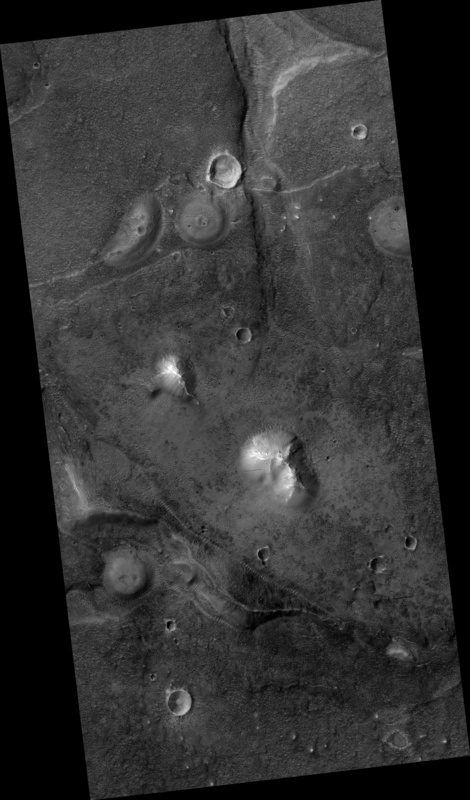 The image includes some large troughs, up to hundreds of meters wide. These are also widespread in the area, forming crudely polygonal patterns on a multi-kilometer scale. 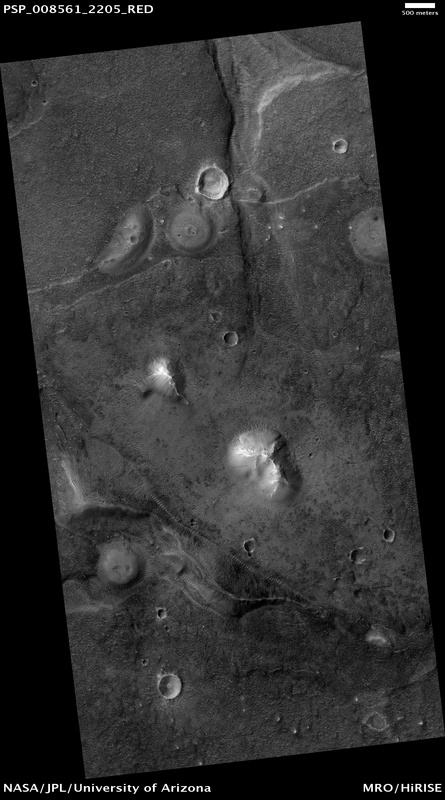 These are distinct from the small polygons like those at the Phoenix landing site, which form by thermal cycling in ground ice; the origin of these giant polygons is still a subject of ongoing research.